Earlier this year, we rolled out our new Ensemble Video Version 4.8. We and our customers are excited about our updates and improvements in accessibility, media ingestion, publishing and reporting features. Here, we’ll give a quick overview of our new features and answer some frequently asked questions from university IT teams about Version 4.8. You can learn more about the ins and outs of each of these new features here. Why does my school need interactive transcripts and audio descriptions? Legislation requires all schools –– from K-12 to higher education –– to make media accessible to viewers. Closed captioning has long been the go-to for video accessibility, but audio descriptions and interactive transcripts are also major components to making media accessible to viewers with hearing or visual impairments. These features also allow all students to search in videos, check the spelling of technical terms and easily revisit video content. Why do we need YouTube ingestion? Faculty can import any YouTube video to Ensemble Video. Instead of sending students to multiple platforms to view the video required for coursework, your faculty can manage and deliver videos in one standard playlist interface, customized with your institution’s security settings and branding. 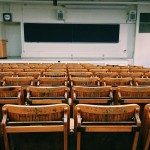 What if my faculty isn’t confident making and sharing videos? If your professors and other faculty aren’t yet comfortable creating videos to share with students, that’s okay. They can still use Ensemble to share visual media with their students. Users can easily create an image gallery or ingest video content from YouTube to include in a course library. What can my faculty do with image galleries? Faculty and staff across departments can take advantage of image galleries. Art and history professors can present virtual art shows to students. University marketing teams can store campus images for promotional materials. You can even upload images to create self-help tutorials for your team to follow along with when they experience technical difficulties. The possibilities are (almost) endless. How do I find the total duration of my entire video library? You can use Ensemble’s new Video Duration Report to find view the total titles, total duration, average duration and non-captioned duration of your library of media content. You can use this report if you would like to determine the total duration of video in your deployment and how much of it is not closed captioned. Many Ensemble Video customers use this report to understand how much Automatic Captioning time is needed to caption their content, helping them make all of their video content as accessible as possible. How can my faculty use video reporting? Your team can view which of their videos are the most popular, which users are watching videos and how long they’re viewing them. In the new Ensemble Video Version 4.8, faculty members using Ensemble Video in their LMS can get access to viewer reports on embedded videos so they can see which students watched their videos and for how long. Additionally, our new media cleanup report feature allows you to sort files by file size, views and upload date to easily delete unnecessary, old or unused video content. Can I make recommendations for future versions? Yes! We welcome all feedback and constantly work with our customers to deliver a product that meets any and all of their video needs. You can reach out here. Are you interested in giving Ensemble Video Version 4.8 a try? Request a free trial or schedule a demo with our team. Or, if you have more questions about Version 4.8., submit a support ticket. Now that you’ve learned what’s new in version 4.8, is Ensemble right for your university? Every college is different. That’s why it’s important to find the right video platform that fits your school’s most pressing needs. 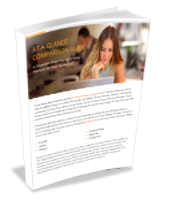 Download our comparison guide now to find the perfect platform for your institution.